Have year heard about theses FREE, after school programs from P.A.P.A? These 7-week programs includes dinner and incentive for participants! Kids will meet in a trusted environment where girls and boys can express their dreams, fears and what matters the most in their journey through life. First 5 registered participants who complete the program get a special gift! 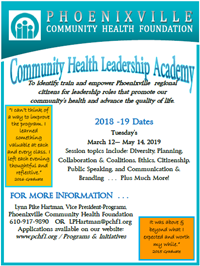 © 2019 Phoenixville Community Health Foundation.